Nikon has enhanced its Coolpix range with the announcement of its new 14.1-megapixel Nikon COOLPIX L120 digital camera, which features an advanced backside illumination CMOS sensor, high-power zoom with 21X optical zoom, 3-inch clear LCD monitor, EXPEED C2 dual image processor, high sensitivity ISO range up to 6400, 1GB internal memory which capable of capturing approximately 330 still images, and 720p HD movie recording. The new L-series COOLPIX L120 cameras will be available in 3 variants of stylish color – black, red, and bronze. The new L-series digital camera combines the simple operation and advanced functions to make using a digital camera enjoyable. In addition, it also comes with new features such as new side zoom control, four different automatic anti-blur functions, and flash pop-up button to improve the performance of it high-power zoom. 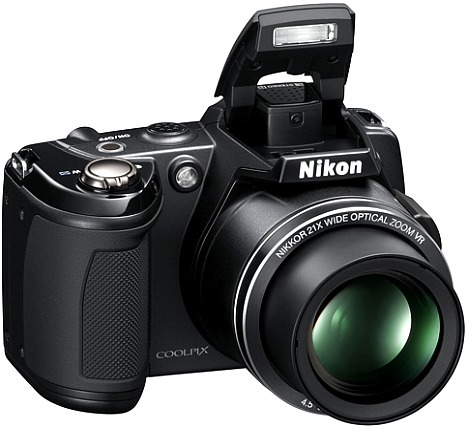 Nikon COOLPIX L120 which measures 109.9 x 76.5 x 78.4 mm and weighs only 431 g will hit the market later this month for approximately $279.95.